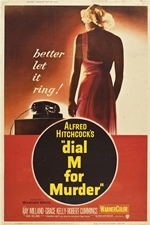 Dial M for Murder is a 1954 American crime thriller film directed by Alfred Hitchcock, starring Ray Milland, Grace Kelly, and Robert Cummings. The screenplay and the successful stage play on which it was based were both written by English playwright Frederick Knott, whose work often focused on women who innocently become the potential victims of sinister plots. The play premiered in 1952 on BBC television, before being performed on stage in the same year in London's West End in June, and then New York's Broadway in October. The movie version was released by Warner Bros.